We are currently using PAYPAL as one of our payment options. You can use credit cards and other methods of payment with PayPal. We will be adding other payment processors in future. NOTE: MATH-COPPER LLC is our official business name. PayPal is a mature, secure and easy to use payment system which allows you to use your credit or debit card to make online payments. You are guaranteed compliance with current payment processing rules from the start of your transaction to its completion. This is the default payment system owned by and utilized by eBay. PayPal gives you the flexibility to pay however you like when you shop or send money. When you hit the checkout button you will be taken to our checkout page. If you have shopped with us before, you were asked to register. Simply use that email address and password to proceed. There is a Paypal checkout button there that allows one click payment. If you haven't shopped with us before, you will be asked to complete your customer information as with any other online store. This also registers you for future purchases. Since you provide us with no payment information, we keep no credit card, banking or other information in our systems. 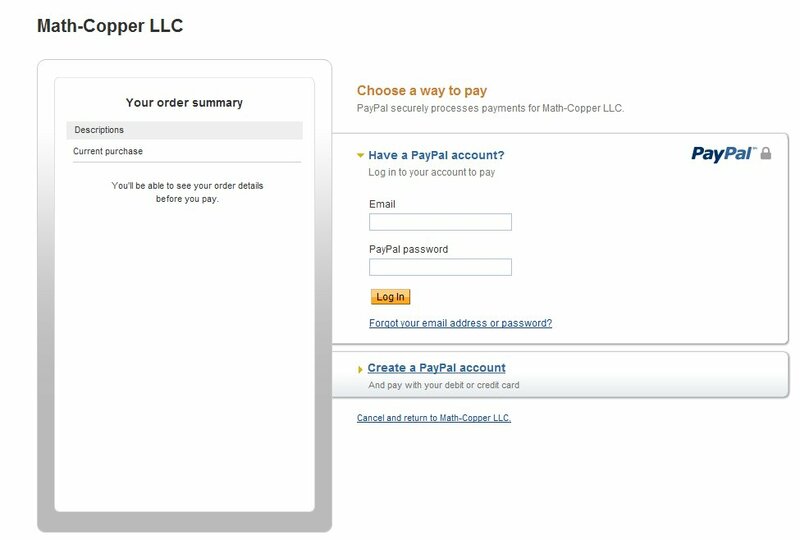 Once you complete the requested information and hit the REGISTER button you will be taken to the PayPal Payment page. If you already have a paypal account use your login and follow the instructions. If you don't have a paypal account you will be asked for the pertinent payment information to complete your transaction. Once complete, you will be returned to our store. You will receive an order email from us and a payment email from PayPal. You can also cancel your order from this screen. First, shop at eBay, or any other online retailer that accepts PayPal. When you're ready to check out, choose the PayPal button. Log in entering your email address and password and we'll process the payment without sharing any of your financial details. How Can I Pay for My Purchases Using PayPal? Bank Account: The money comes directly out of a bank account that you link to your PayPal account. Debit or Credit Card: Choose to pay with your credit card and keep collecting your credit card reward points. PayPal Balance: Turn your PayPal account into an easy-to-monitor spending account by adding money to your PayPal balance. You can increase your PayPal balance by transferring funds from your bank account, adding money via MoneyPak, or receiving money from friends and family. If you have enough money in your PayPal balance to cover the payment, then PayPal will use this money first for your payment. Cash* via MoneyPak™: Add funds to your PayPal balance without having a bank account or credit card. Then use this money to shop and send money using PayPal. PayPal Extras MasterCard®: Use your PayPal Extras MasterCard to get 2x points for all your PayPal and eBay purchases. You can redeem points for gift cards, merchandise, travel deals, or cash back as a credit into your PayPal balance. Bill Me Later®, a PayPal service: Use Bill Me Later financing to get up to six months to pay. It takes just seconds to use when you check out with PayPal. Bill Me Later's flexible financing empowers you to buy what you need, when you need it. *Use cash to buy a MoneyPak card to fund your PayPal account. Available in the US only. Usage of this service is subject to identity verification and other controls. This service is being provided by a registered Money Services Business. Absolutely. Just link your credit card to your PayPal account when you sign up or add it later. Then simply select your credit card as your method of payment when you check out using PayPal and you'll rack up the rewards! For More information on using Paypal please visit them at: What is Paypal?